May 17th, 2016 | Moving Tips. Most people who are preparing to move investigate their future neighborhood or home and verify details long in advance. But what happens if you’re in a situation where you can’t plan for your future home months before you move? Those applying for jobs out of state or to distant graduate programs know the added stress of not knowing where they’ll end up. True, you know the places where you might end up, but that doesn’t help when the notifications about your new job or program arrive only a month before your required relocation. If you’re waiting to hear back from several companies or graduate schools, you’re likely the type of person who prefers to plan things in advance. Without a plan, you feel like you’re flying blind. Regardless of what you might think, there are ways to prepare for your move, even if you’re currently unaware of the destination. Despite feeling like your hands are tied when it comes to making preparations, below you’ll find four specific ways to prepare for a move. 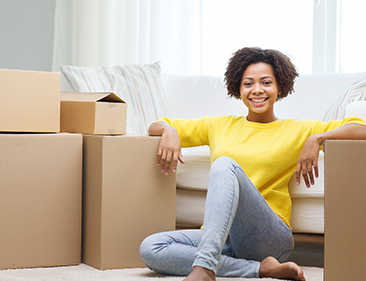 Implement these tips to have a successful move, regardless of where you end up. Although you aren’t able to look at destination housing options yet, you can do many things to get your current home in order. Organize your home and your possessions now to help you feel ready when you finally get the news of where you’re going. Go through your junk drawers, storage closets, and attic. Decide now which items you can afford to get rid of. When you assess your items from the perspective of someone about to move, it becomes easy to let go of what you don’t need. If you’re moving out of state or across the country, don’t lug around unnecessary baggage. Take only what really matters-things that will help you feel at home in a new and unfamiliar place. When the time is right, sell or donate what you’ve deemed unworthy of the move. The results will leave you feeling organized and far more prepared to tackle what comes your way. Your initial reaction to this tip might be disbelief; how can you research your future destination and its hot spots when you don’t know where it is? But we’re talking about a different kind of research that’s just as important: research for the right moving company. True, you might not obtain accurate quotes until you know the mileage of your move, but you can still investigate different moving companies to fit your needs. You don’t need to know where you’re going to discover which moving companies serve to your satisfaction. Ask for proof of insurance and other qualifications to help you make an informed decision. Call your top candidates and make sure they offer warranties and flexible transportation. With these established points of contact, you’ll know exactly which company to choose when the time comes. Another way to minimize your stress despite uncertainty comes in the form of a planner. It doesn’t have to be anything fancy-just a notebook where you can keep information relevant to your move. Thanks to your planner, you can keep every quote, estimate, receipt, and checklist you make for the future in one place. When you need to look up the information for a moving company you talked to months ago, you’ll have the notes at your fingertips. This planner will also motivate you to make initial calls to your medical providers and old schools for necessary transfer information. If you don’t know how to go about transferring bank, medical, or insurance information, start learning how now. Record what you’ve learned in the planner so you’re prepared to use it when the time comes. With the above tips at your disposal, you won’t feel overwhelmed and helpless every time you think of your future move. When you learn and plan now, you can ready yourself mentally and emotionally for relocation. Through these tips, you’ll be well-equipped to proceed with your move when you finally receive your long-expected news.